A couple of people have asked me what bags I use on my travels so I thought I would share. I would love to hear what other people use as well. Finding good travel bags is essential. You want as light as possible with good functionality and is extremely durable. Although how and what you pack does impact the performance of a bag, finding a good bag cannot be dismissed. I will have to say that I have had more luck with travel bags than purses. At forty years old, I have yet to find that elusive perfect purse (or lipstick shade!) that fits my daily routine. Maybe it’s a sign. Maybe I should just stick with travel bags and the lifestyle that goes along with it! For my every day commute and weekends I use one of two PacSafe City Safe 200 bags that I have. Depending on my mood I use a black one or a red one (right now it is mainly the red). It is strong, durable with the perfect amount of compartments for important items like my wallet, my phone, my headsets and my BART ticket. It fits a mini-sized umbrella on the side as well. It is perfect for going back and forth to work and getting around on the weekend. Depending on the length of my trip, I also take it as my day bag. Other times I use my custom Timbuk2 extra-small messenger bag. I have a larger size that I use as well. My husband uses a large messenger bag every day as well as on our vacations. It is a great bag, well made (here in San Francisco) and holds a lot inside. 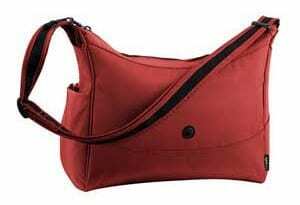 The pockets, compartments, zips and latches are all carefully designed and well thought out. Those are the bags that I use to carry all those things that are not clothes: phone, wallet, journals, my camera, etc. When it comes to my actual luggage it obviously depends on the length of stay. 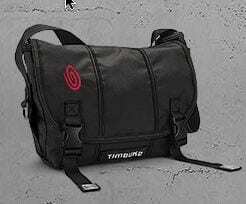 For a one or two night trip I have now settled on a great overnight bag from Timbuk2 called a Cargo Tote. I mentioned this piece on Sunday in my post about traveling lite on Virgin America. As long as all your liquids are under three ounces you are totally set for a night or two with this bag, it is awesome. For two or three nights I have an R.E.I. 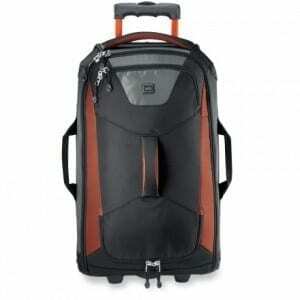 Tech Beast Rolling Duffel. It’s a good size for carry-on, not a complete bin hog. It’s a sturdy product that should last quite awhile. My only complaint on this bag is it is a bit heavy. For anything longer than three nights, and my go-to bag for years, I use an R.E.I. duffel that they don’t seem to carry anymore, but it is very similar to the R.E.I. Wheely Beast Rolling Duffel. My husband and I have four of them, we’ve had them for close to five years. They have been all over the world and they are amazing! I can’t tell you how much stuff one of these babies can hold, I have yet to fill it to a point it wouldn’t close, although I have reached weight limits! There are handles everywhere to make moving them around a breeze, they can be picked up from nearly every angle. When I have to maneuver with two (anytime I go to France!) I can easily manage them effortlessly – with me being only 5’0″ tall and two of these guys filled to the brim, that is saying a lot! So there you have it. Those are the bags used by the Misadventure family. We put our bags through a lot, these are the ones that have consistently performed over time. How about you? Got a favorite bag that you want to tell me about? I am actually in the market for a new piece of luggage, as the one I have always used has seen it’s better days. For my purse – I found a fabulous bag by The Sak that I used when I recently went to London/Paris. It folds over to make a smaller bag, or a clutch without the straps. It worked out great! @Cathi, oh that sounds like a great bag! @AndiP, I am not familiar with that one, I’m going to have to check it out. I have a Samsonite made of some polycarbon that weighs practically nothing when empty. I hate to have a suitcase that is heavy before it is even packed. And it has 4 wheels. God bless the genius who thought of putting wheels on suitcases. Ummmm….right now I’m using a black roller thing with a handle that sticks that I got on the sidewalk on the Lower East Side of Manhattan. FOR $15. I’m thinking I should really upgrade as I have a lot of travel coming up. Hey, I’m nothing if not classy. I’ve been carrying my Rick Steves Classic Back Door Bag for nearly a decade and can’t imagine being without it. Whether I’m traveling for a weekend or several weeks, it always seems to be the right size. It can be carried on and used as a backpack or carried with a handle. Love it. @SusanM, GOT to check that out! @Elisa, smart call on the duffel. I should have mentioned in my post that I usually toss in a large Longchamps folding bag for extra purchases that I can bring as a carry on for the trip home.